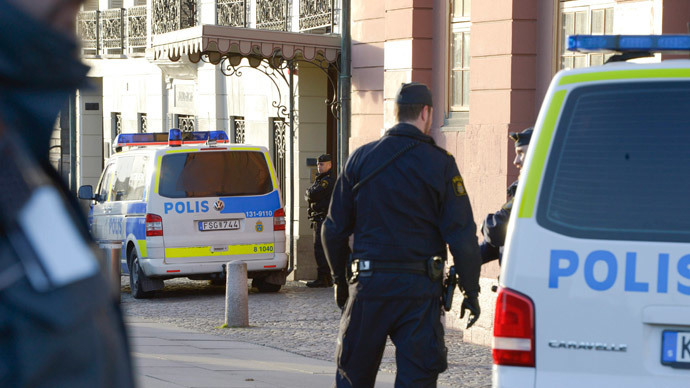 A Swedish woman’s 21st birthday celebration turned into a nightmare as police raided her house. She had hung two balloons to celebrate her age, but when “21” was viewed in reverse, they thought it stood for IS, short for Islamic State. The balloons in question, which had been put up to celebrate Sarah Ericsson’s birthday last weekend, were noticed by a passerby, who subsequently alerted the police after looking through the window of the house and seeing what was believed to be a symbol supporting the Islamist militant group. "We understand why someone would report it if they thought it looked like IS propaganda, although everyone else just thought it looked like the number '12' from outside," Ericsson told The Local. The following Monday, Ericsson went to college. Her boyfriend Fabien Akesson was getting ready to do the same, when he got a knock at the door. “I had just got up and was getting ready to go to college. I was brushing my teeth and looked out of the window. I saw a police car parked at the entrance to our street and was wondering what they were doing here,” Akesson said. The police were heading to their house to take a closer look at the balloons. "I laughed about it and they showed me a photo that they had taken where from their perspective, it did almost look like the letters IS," he told Swedish newspaper Kvallsposten. Akesson and police joked about the matter, and the police admitted they had made an error. However, Swedish law enforcement officers asked him to take the balloons down from the window to avoid any further confusion. “I've never experienced anything like this before. The patrol got there and found out that someone had celebrated their 21st birthday,” said police officer, Kurt Erik Gunnarsson, according to the Swedish newspaper. Ericsson said she understood the situation and how it could have been perceived. "Extremism should always be taken seriously, and we did take the balloons down immediately," the student said, The Local reported. "I'm so surprised at all the attention. I will never forget my 21st birthday!"